You will notice that our editorial has been a bit skimpy the last few weeks but don't worry, our editor Nancy will be back soon to give you the quality eguide that you are used to with music downloads, roots music charts, etc. While performing over 170 shows throughout the US in 2007, Shane and his band still were able to find the time to record their fifth CD titled WHAT YOU NEED. After winning the Monterey Blues Festival Battle of the Bands in 2002, his career catapulted into the forefront of the West Coast Blues scene. As the San Francisco Chronicle wrote that Shane is fast becoming The Blues Sensation of the West Coast. Before long, word spread and Shane was making a name for himself throughout the country. Shane is a Great vocalist and One Hot guitarist stated Dan Aykroyd as he featured Shane on his internationally syndicated House of Blues radio show. Shane has sold over 45,000 CDs from venue sales while performing in festivals in Florida, Nevada, Washington, Oregon, Oklahoma and California. His previous CD, COME SEE ME has received rave reviews such as this one in Southland Blues Magazine, This album holds a position at the TOP of our ten best. WHAT YOU NEED is a mix of original songs written by Shane, as well as some great blues standards. This CD is very diverse in its song content, ranging from strait forward blues to rock and country blues. CLICK HERE to see Shane LIVE in concert! Tickets are now on sale for the most prestigious event in all of Blues music in 2008. The Blues Music Awards, to be held Thursday May 8, 2008 at the Grand Casino Resort Tunica (soon to be Harrah’s Casino Tunica), brings together Blues performers, industry representatives and fans from all over the world to celebrate the best in Blues recordings and performances from the previous year. Each year, the Blues Foundation presents The Blues Music Awards to the artists selected by its members. The awards are universally recognized as the highest honor given to Blues artists. Tickets are on sale online at www.blues.org/tickets/bma.php. On that site as well, members are able to access the ballot to determine which of the nominees will be selected to receive the 25 Blues Music Awards. Rooms can also be booked now at the special Blues Music Award rate by calling Grand Casino Resort Tunica at 1-800-394-7263 and mentioning the group code S05BLUE. The Blues Music Awards will be held at the Grand Casino Tunica Event Center, which is a state-of-the-art, 2,500 seat venue. 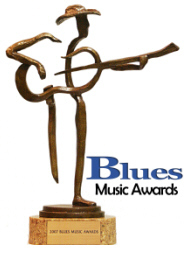 The State of Mississippi, the Tunica Convention and Visitors Bureau and Harrah’s Casino Tunica are sponsoring the Blues Music Awards.Call 1-888-4TUNICA to request a value-packed Winner’s Guide, or visit www.TunicaMiss.com for travel information. RESERVE AD SPACE FOR THE BLUES FESTIVAL GUIDE MAGAZINE! The Blues Festival Guide Magazine is now accepting ad orders for the 2008 issue. Don't miss this once-a-year opportunity to market your band, new release, service, product or festival to 100,000 blues fans. Affordable and effective! Email advertising@bluesfestivalguide.com or call 775-337-8626 for rates and information. Please note RBA Publishing Inc. is not able to accept responsibility for any losses or damages to any person acting on information contained on these pages, or warrant that information contained within articles, etc. are bona fide. Please check any details carefully before parting with any money. Buckingham Ft. Myers, Florida, U.S.